The moment we all wait for the red carpet for the joy of our eyes only. 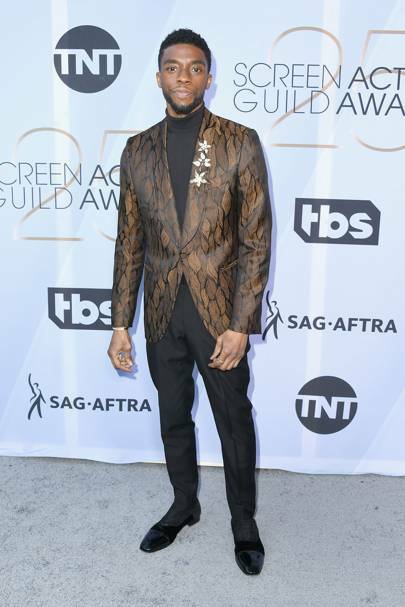 From Lady Gaga in Dior couture to Emma Stone in Louis Vuitton, Margot Robbie in Chanel and Sandra Oh in Jenny Packham, see the red-carpet highlights from the Screen Actors Guild Awards 2019. El momento mas esperado es la alfombra roja para el deleite de los amantes de la moda he aquí los mejores diseños de la noche. Emily Blunt Wearing Michael Kors Collection with a Jimmy Choo clutch and Forevermark jewellery. Amy Adams Wearing Celine by Hedi Slimane and Cartier high jewellery. Gemma Chan Wearing Oscar De La Renta, Harry Winston jewellery and Christian Louboutin heels. Margot Robbie Wearing Chanel and Chanel high jewellery. Elizabeth Moss Wearing Monique Lhuillier. Yara Shahidi Wearing Fendi Couture, Cartier jewellery and Christian Louboutin heels. 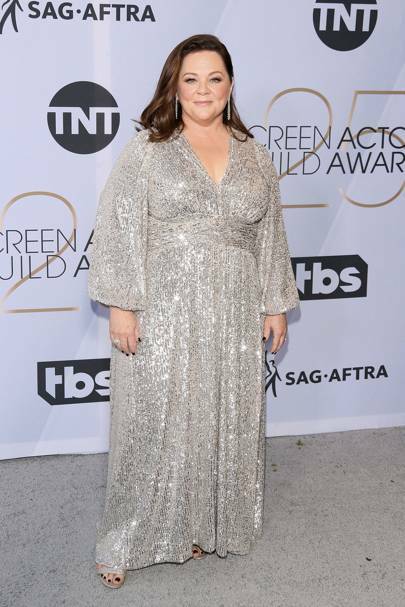 Melissa McCarthy Wearing Sam Edelman shoes and Chopard jewellery. Lucy Boynton Wearing Erdem and Harry Winston jewellery. Laura Harrier Wearing custom Loewe and Bulgari jewellery. Timothée ChalametWearing Celine by Heidi Slimane and Cartier jewellery. Lupita Nyong’o Wearing custom Vera Wang and Roger Vivier shoes. Sandra Oh Wearing Jenny Packham and Atelier Swarovski jewellery. 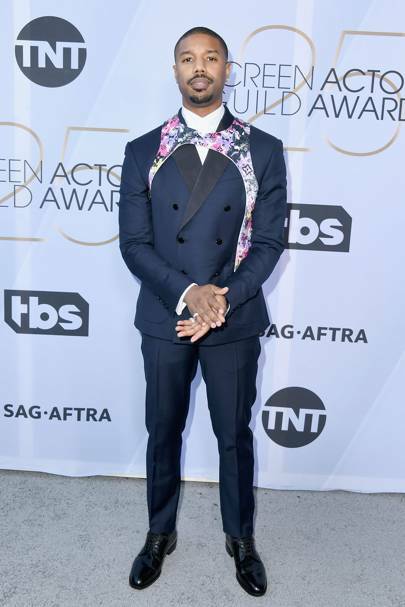 Chadwick Boseman Wearing Ermenegildo Zegna, Christian Louboutin shoes and Tiffany & Co. jewellery. Angela Bassett Wearing Georges Chakra, Casadei shoes, a Tadashi Shoji clutch and Kimberly McDonald jewellery. Danai Gurira Wearing Ralph & Russo and Bulgari jewellery. Rachel Weisz Wearing Givenchy Haute Couture and Cartier jewellery. 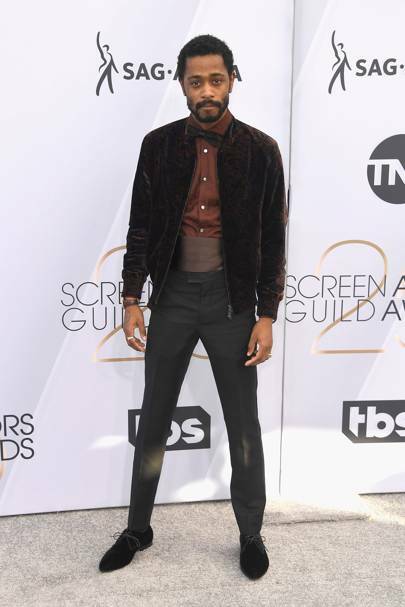 Lakeith Stanfield Wearing Ermenegildo Zegna and Bulgari jewellery. 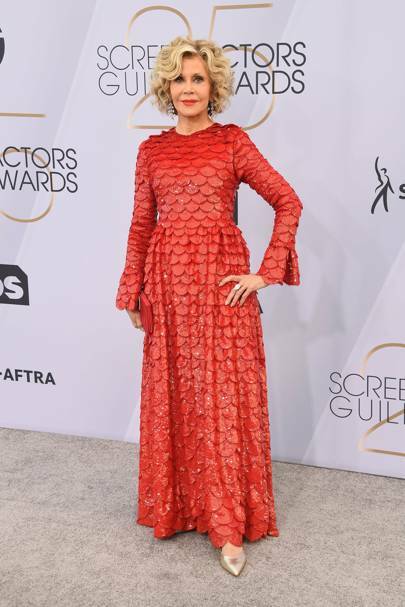 Jane Fonda Wearing Valentino and in Sarah Flint shoes and Gismondi jewellery. Rachel Brosnahan Wearing Dior Haute Couture, Jimmy Choo heels and Irene Neuwirth jewellery. Catherine Zeta Jones Wearing Zuhair Murad Couture and Chopard jewellery. Alison Brie Wearing Miu Miu. 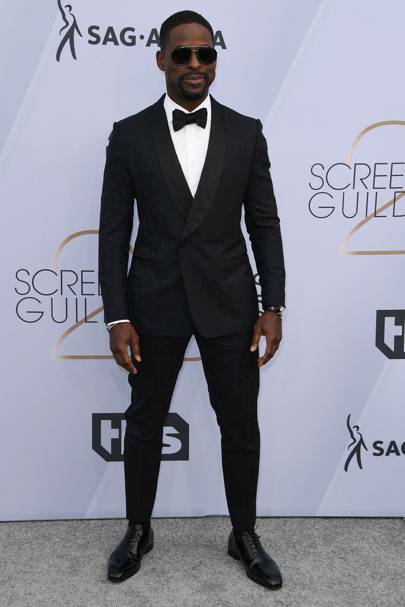 Dave Franco Wearing a suit by Christian Dior and Christian Louboutin shoes. Next ArticleSAG 2019 Winners, more than just an Awards, La preemisión fue mas que dar reconocimientos se convirtio en.